For the next several weeks we are going to do a quick tour of the history of philosophy. This is not meant to be exhaustive, but give you a general map of some of the key concepts and ideas. Philosophy is not the history of philosophy, but you cannot do philosophy without its history. First of all because all philosophers are in argument with others, and you don’t know what they are arguing about if you don’t have a grasp of the context of their argument. Secondly, there is a lot of technical jargon in philosophy, so if you don’t know what the concepts are, then you can be totally confused (especially since a lot of these concepts sound like words we ordinarily use, and you soon come to realise that ordinary definitions are pretty worthless when it comes to philosophy). Some people argue that history isn’t important in philosophy, but I don’t agree. Philosophy is historical through and through, like any human activity, and the idea that philosophical ideas are timeless and eternal, is itself an historical idea. There seems something very strange to me to treat Plato’s problems as though they were exactly the same as our, and what he meant by the words he used, is the same as what we do, even though there are thousands of years separating us. Of course, in the end history does not answer everything, but not to know the history leaves you very much in the dark. When we come to read Descartes’ Meditations we can be very blasé about it. Doesn’t everyone know the famous cogito ergo sum, and has the idea that reality is a dream the basis of a very successful movies series? Because we have become very used to Descartes’ ideas, we also think that they are very easy to dismiss and counter, as though we hardly have to think about them at all. To understand Descartes, however, like every philosopher, is to know what his problem was, since metaphysics is always an answer to a problem. His problem wasn’t whether reality existed or not, but what is the status of our scientific theories. Scientists, on the whole, are not interested in metaphysical problems, but of course philosophers are. Descartes’ Meditations cannot be understood without the rise of new sciences in the 16th and 17th century. 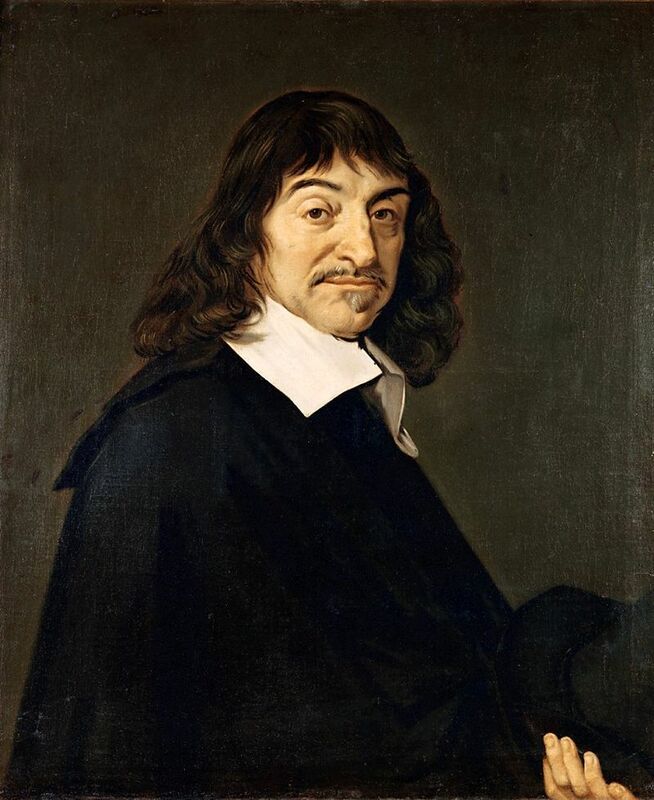 Before he was a philosopher, Descartes was a scientist and mathematician. What propelled him towards philosophy, was his worry about the metaphysical consequences of the new science. Something he believed, for example, that Galileo had not been sufficiently concerned. What this new science required was a completely different metaphysics, but before we can understand what this is we need to be aware, if only in a very schematic way, the metaphysics he was rejecting, which was Scholasticism that had its basis in a reworking of Aristotle. Now the point is, if you are going to reject the scientific account of Aristotelianism, then you are also going to have discard the metaphysics that underpins it. This is what Descartes does and he thinks Galileo doesn’t. Fundamentally for Aristotle, everything that exists is explained through form and matter. It is the form of something that explains what it is. Thus to understand what it a tree is one has to understand the ‘form’ tree. If we are looking at an oak tree, then the form would be contained in the acorn. This is true, just as much for animate as well as inanimate things. So to explain the sun, we also have to understand the form of the sun, as well as its material existence (which for Aristotle was the four elements, plus the mysterious fifth one, aether). For Descartes, there is only a material explanation of nature. If one wants to understand the sun, then one needs to understand the nuclear fusion of hydrogen to helium. Moreover, these material laws are the same for all objects in nature and the whole of nature itself. The explanation of our sun would be the same as for all suns in the universe, and these explanations would be would be the same for everything that exists (that is, matter in motion, which can be mathematical defined). The different physics of Aristotle and Descartes means that they have completely different metaphysics. The basis of the universe for Aristotle is individual substances. Because matter is not sufficient to explain what it is to be something, there cannot be a material explanation of nature. Each thing is an individual substance, which is the specific conjunction of form and matter, whether we are speaking of a tree or animal, me or you, the sun and the other stars. For Descartes, there is only one thing that exists and that is matter in motion, and every individual thing we see is only a property or a mode of this one material substance. Things differ only because matter differs (there is a difference is shape, size and motion of particles), not because there is an extrinsic difference between them. We can see in Aristotle’s metaphysics, that we need an explanation for each thing (if we wish for a total explanation), whereas for Descartes, we only need a few simple laws of motion (three), in order to explain everything that we see, and that these simple laws of motion, since they have to only to do with shape, size and motion, can be explained quantitatively (that is mathematically) other than qualitatively in the Aristotelian system. Only now with this scientific background, can we really begin to understand the Meditations. Descartes’ scepticism, at the beginning, then, is not merely an amusing thought experiment, which will later become the plot of the film Matrix, but presupposes the fundamental break that modern science has taken with the common sense perception of the world. For the hypothesis that nature is matter in motion is precisely that a hypothesis, which one can quite literally not see, and thus what I see cannot itself be true. Thus, the task for Descartes is not to destroy our knowledge of the world, but to rebuild it, but where the foundations will be more secure, no longer resting on our fallible senses, but reliable understanding and reason. Scepticism is not employed for its own sake, or even to make philosophy impossible, but on the contrary, to make our knowledge of the world even more certain, by showing that sceptical arguments can be defeated if our metaphysics is robust enough. If I can doubt everything in reality, even that my mathematical ideas are a true representation of what is real, then there is one thing, Descartes argues, that I cannot doubt, and that I am thinking. For even if I doubt everything, there is one thing I cannot doubt and that is in the very act of doubting, I am in fact doubting. What is important at this point in Descartes’ argument is not to confuse the status of the ‘I’ in the statement ‘I think therefore I am’. This I is not me as physical being. The ‘I’ that stands before you know, the ‘I’ that is writing this lecture on the computer. My physical reality is just as doubtful as the reality of the rest of physical nature. Also this ‘I’ only exist in the very moment of thinking. Only in the very act of thinking can the ‘I’ be said to exist, because it is self-refuting to argue otherwise. Even if I say, ‘I do not exist’, it is I who am thinking this, and so must exist in the moment I think it. Though the cogito is very limited in one sense, it also includes a lot more than one might first assume. First of all Descartes includes all acts of consciousness, such remembering, desires, and most importantly for us, perceiving. Thus when I desire something, I exist in the moment of desiring, when I remember something I exist in the moment of remembering it, and when I perceive something, I exist in the moment of perceiving it. When I perceive a something I exist in perceiving it. Of course, following from radical doubt of the first meditation, I don’t know whether what I perceive is the same as what is in reality (it really could be all a dream, or mathematical code as in the film Matrix), but I cannot doubt that I am perceiving the chair. Secondly, and this is going to be very important when we come to look at the wax example, the content of what I think, desire, remember and perceive is also real Again, it is not real, as in ‘out there’, but real in my mind. So when, I am thinking, remembering, desiring, perceiving a chair, I really am thinking, remember, desiring, perceiving a chair, even though I don’t know whether a chair real exists. When we come to the example of the wax in the third mediation, therefore, we can become completely confused if we think Descartes is talking about the external perception of the wax, because this is precisely what he has given up (we don’t know what the real wax is, because we don’t even know if reality is real). What he is describing is our idea of the wax, how the wax appears to us, even if we don’t whether the wax is real or not. His first description, then, is how the idea of wax appears to us when we take the wax as something we perceive, but perception means here, perception as an action of thought (I am thinking about how the wax is perceived by me), and not perception as the sensation of an external object that I take to exist really outside of me and which effects my sense and which I then think of as was (our example of real qualities and the red flower above). If we were to take that Descartes was doing the latter, then we would be confusing him with Aristotelian account of perception. What do I think I perceive when I think that the idea of wax is sensation? I have a list of properties that describe the wax. It smells of flowers; it tastes of honey; it makes a sound when you tap it; it is hard and cold to the touch; and it is white and the shape of a cube. Doesn’t this, then, tell us exactly what the wax is. Why would we need to know anymore? We remember, though that Descartes is sitting in a warm room (it tells us at the beginning of the Meditations). With the heat of the room, all the properties of the wax change: there is no fragrance of flowers; no sweetness of honey; no sound when a hit it; it is not hard and cold; it is no longer white and shaped like a cup. How, therefore, can the sense tell us what the wax is, since now it is completely change. The idea of the wax under the thought of perception is a completely confused idea. However, even though I know the wax has completely changed, it is nonetheless the same piece of wax that remained the same throughout this transformation. What is this wax? It can’t be the list of properties of the sensation because these are completely different. It must be what remains when we strip away all these properties that have changed in our idea of the wax itself. What is it that remains? It is the idea of the body in general as ‘something extended, flexible and changeable’. Although I cannot experience this body, since it would have innumerable shapes that I cannot imagine, I nonetheless can think it, and the idea of this body is less confused and incoherent understanding of the wax in general, than what is present by the idea of sensation. Going back to Descartes’ definition of truth, it is, therefore more true. True, however, only internal to my own thoughts. Not true as true to reality. I still have no idea whether reality is what my ideas say it is, however internally coherent my ideas are. At this point we haven’t got outside the cogito itself. I can say that the idea of extension as the correct understanding of bodies, rather than their real qualities, might make more sense, but it does not mean that the what the wax is in the real world is anything like that at all. At this stage, extension (that matter is extended in three dimensions) as the explanation of all the phenomena we see, including the secondary phenomena of the senses, is merely a hypothesis. To prove that nature in itself is like that, we need to get outside of our minds. But how are going to do that? Through the proof of the existence of God, because the idea of God is a very strange idea, and necessitates the actual existence of the content of the idea, in the way that no other idea I have does. It is at this point that we can get confused about Descartes’ philosophy. We are told that he is a rationalist and that he is attempting to ground the new science in more rigorous metaphysics, but we associate the idea of God with religion, or even worse with superstition. Why would he know introduce God? Isn’t he rejecting reason altogether? This answer to this question is to go back to the problem. The new science postulates a mathematical reality which is not open to the senses. How do I know that this isn’t a fiction? To the practical scientists this is not a problem. She isn’t worried. She just gets on with her experiments. For the philosopher that isn’t enough. He wants to know that reality really is what we say it is. For this we need there is an external guarantee and this is what God is. Descartes is not proving the existence of God because he lacks faith. He already believes in God. He does not need a proof. We are speaking here of a philosophical concept of God and not a religious one (although as we shall see with Spinoza’s criticism of Descartes, in the conclusion to this this lecture, he might sneak a theological notion within this concept). The concept of God is solving a philosophical problem for Descartes, how do we know that are scientific hypothesis that we cannot see with our senses, is actually telling us the truth about the world, and not a crisis of faith. One of the problems for the modern reader following Descartes proof is that he uses Scholastic terminology that they might not know. Let us briefly explain this jargon before we look at the argument itself. When it comes to ideas in our minds, Descartes makes three important distinctions: objective reality, formal reality and eminent reality. The objective idea of the triangle is the idea of the triangle insofar as it represents a thing. The objective reality is not the thing represented, but the representation. One of the best ways to think of this is in terms of the operation of an image, though we should be careful here not thinking that Descartes thought that all representation were images. Thus when we say that a picture is a picture of something we can distinguish between what the picture is and what the picture represents. In the case of a picture of a tree for example, we can distinguish between the picture and the tree that is represented in the picture. What is much more difficult is the idea of formal reality in Descartes. It is much more difficult because Descartes himself seems to be confused about it. We could interpret formal reality to be the actual existence of the thing that is represented in the idea. But this would admit the existence of external things, whereas we are only talking about the nature of ideas. Formal reality is the part of the definition of the idea and not the description of a thing. Many misunderstandings of Descartes have to do with confusing the formal reality of the idea with the reality of a thing. On the contrary, the formal reality of the idea describes the status of the idea itself. Whatever idea we speak of and whatever this idea might represent, the idea itself exists. Again if we go back to our picture example, being mindful that ideas are not pictures for Descartes, so that this is only an analogy, then we can make a distinction between the picture, on the one hand, and what the picture represents on the other. Now the picture, on this analogy, is the formal idea. That is to say idea of the tree itself, and not the tree that is represented in the idea. This relation is essentially causal for Descartes. That is to say that the formal idea is the cause of the objective idea. We might put it this way. In the absence of the idea of the frog, they would be no ‘frog’ as an object of the idea. This means for Descartes that the idea of the frog, it formal reality, is the cause of the objective reality of the frog. It is not just the causality of ideas that we need to be aware of, but also, as we have already seen, that reality means for Descartes ‘degrees of perfection’. The proof for the existence of God is a combination of causality and perfection. Thus the formal reality not only causes the objective reality to exist, but also the degree of perfection that this idea has. Descartes regards it as a fundamental axiom that more cannot come from less. If the formal reality is the cause of the objective reality, then there must be as much reality in the formal reality as there is in the objective reality. We need to be very careful that we are speaking about ideas and not objects here, and the best way to think about it is again in terms of a picture. Descartes’ argument is that a picture will have more reality the more reality that the object of the picture has. Thus to use Bernard William’s example: a picture of a pile of sticks will have less reality than a picture of a complex machine, precisely because the complex machine, as an objective reality, has more reality than a pile of sticks (Williams, 2005, p. 124). The best way to think of the relation between objective and formal relations, when it comes causality and perfection, is therefore backwards. From the complexity of the object of thought we go back to the complexity of the idea which is the origin of this thought. The question, then, is how I get from this relation between formal and objective reality of ideas to the proof of the existence of God. Again we need to remember that this is a causal relation for Descartes. The idea must have as much reality, perfection or complexity, as the object that it represents. In Descartes language, it contains formally as much reality as the object contains objectively. But this does not present it having more reality than the object it represents. In this instance, Descartes says it contains eminently what the object of thought only contains formally. But how does this further distinction get us any closer to the idea of God? Descartes asks whether it is possible that there is one idea that contains formally what I cannot be the cause of objectively; that is to say, whether there is an idea whose objectively reality, whose object of thought cannot have its origin in me. Thus if I look at all the content of my ideas, I can see that they can all have their origin in me, but the objective reality of the formal idea of God cannot. Why is that? What is it about the idea of God that means that its objective reality cannot be inside of me and that it must exist outside of me? It is because the very formal idea of God, the definition of God, contains an objective reality that I could not be the cause of because I know that I myself am an imperfect being. We have already agreed that what has less perfection cannot be the cause of something that has more perfection. I could be, Descartes argues, the cause of all my other ideas, since objectively they contain nothing more than I contain formally, but I cannot be the origin of the content of the formal idea of God, the objective reality of God, since this objective reality contains more perfection than I do. That is to say my picture of God is less than the objective reality of the idea, and thus could not be its cause. This idea must be caused by something that existed outside of me, and it must contain formally speaking as much reality as the objective reality of the idea of God. Only God could be the cause of the idea of God. So the idea of God necessarily proves that God exists and we have a little chink in the armour of the cogito. There is one thing I know that exist outside of my idea of it, and that is God. But why would that solve my problem with the wax. Why would the existence of God demonstrate that my idea of wax must be what the wax is in nature? It is the existence of God that guarantees the existence of external objects, and also that my idea of these objects correspond to the true nature of external objects. What I can clearly and distinctly perceive is true, but without God this truth would not be sufficient, since although I am perceiving this truth in my mind, there might be nothing like it in the outside world. If I can prove that God exists, then it follows that everything depends upon him, since God is the only perfection, and such a God could not deceive me. It follows, therefore, what I clearly and distinctly perceive, and I can remember having done so, must be actually true. The success of Descartes’ metaphysical project rests on the existence of God. It would not surprise many readers that no many philosophers, even immediately so, were convinced by it. Cartesian science itself was pretty much left behind with the success of Newton (though he was clearly influenced by Descartes). However, I want to refer to one important critique of Descartes, which is Spinoza. He was as rationalist as Descartes (and thus his critique is very different from the empiricists and Kant who come later), but his argument with Descartes is that he did not take his ideas seriously enough. In other words, Spinoza wanted to out ‘Descartes’ Descartes. Spinoza issue’s with Descartes is that he smuggles a theological conception of God into his philosophical idea of God, and that is the idea of creation. There are in fact three substances in Descartes: the two finite substances, mind and matter, and the infinite substance God. This mirrors the theological distinction in the idea of creation of the difference between transcendence and immanence. Now the transcendent God is beyond the comprehension of the finite mind (this is the turning point of the ontological proof for Descartes, I know that God exists, but I don’t know what God is, and God in his absolute power could have created a world in which triangles have 4 sides and 2+2=5). For Spinoza this is absurd. If there were a difference between an infinite God and a finite world, then God would not be infinite, since God would lack something; that is the finite world that is different from him. Also God could not be governed by different laws (as though God were a capricious tyrant), because this would mean that laws that came from God could have been different, but this too would mean that God would lack something, which would be the laws that he did not create. If God is infinite, and we start with this infinite, then the idea of transcendent wilful God that is still at the heart of Descartes’ project (which Spinoza will explain is only anthropomorphic idea of God), must be a fiction. ‘God,’ Spinoza writes, is the immanent, not the transitive, cause of all things’ (Spinoza, 1996, sec. 1P18). Rather than explaining attributes in relation to infinite substance, Descartes has explained substance in relation to attributes, and this is why he has ended up with three substances, rather than one unique substance, God, whose essence must infinite attributes (not just two), which express themselves through infinitely many things and ideas. We must begin, Spinoza is saying, with the infinite universe and explain our place within it, rather than projecting an image of ourselves onto this infinite universe. Ariew, R., 1986. Descartes as Critic of Galileo’s Scientific Methodology. Synthese 67, 77–90. Deleuze, G., 1978. Les Cours de Gilles Deleuze [WWW Document]. Sur Spinoza. URL http://www.webdeleuze.com/php/texte.php?cle=14&groupe=Spinoza&langue=2 (accessed 10.9.14). Hatfield, G., 2003. Routledge philosophy guidebook to Descartes and the meditations. Routledge, London. Spinoza, B. de, 1996. Ethics. Penguin Books, London; New York. Williams, B., 2005. Descartes: The Project of Pure Enquiry. Psychology Press. I am thinking of the Matrix trilogy, and the first film in particular. He believed that although Galileo was to be admired, he tended to rush over the subject matter and not explain it sufficiently. The purpose of Descartes’ project was to set philosophy on firm principles and work from these in a systematic way (Ariew, 1986). This shows that Descartes was not as far from the Scholastics as some have presented him, and indeed, how he sometimes presents himself. You are currently browsing the Lectures blog archives for March, 2016.